Winter 2019 Screenwriting Contest – Semi-Finalists! It’s time for more Winter 2019 Screenwriting Contest results! There were a lot of great scripts in our Quarter-Finals and it was tough to make this next round of decisions, but after careful consideration our judges have decided on our Semi-Finalists! There’s often a fine line when it comes to the different rounds of our screenwriting contest. Some scripts only just miss out, and it can be difficult to know why. A lot of the time, it comes down to the execution of basic elements – structure, characters, and dialogue. Take a look also at this article that our Director, Ian Kennedy, wrote when we announced Quarter-Finalists: What your writing submissions are telling us, 2017-2019. If you’re making any of these mistakes, they could be holding you back! Unique Concepts. If there’s something in a script we haven’t seen before, it immediately makes us want to read on. See what Ian wrote in his article about the number of scripts with a vehicle smash at about page 10 – when we’ve read the same thing so many times, it quickly starts to become dull. On the other hand, when we encounter something new – that’s really exciting! Specific in genre and the story they wanted to tell. With a number of scripts, we found it difficult to tell what genre the writer was aiming at and it was a while before the story began to take shape. These unfocused openings usually fail to hold our attention. Be specific about your story, and be clear with its genre! Engaging characters. Ian wrote it in his article but it’s worth repeating again here: “Make us care and get fascinated with your main characters and their world”. When we care about the characters, the script takes on a whole new life. Don’t rely on clichés or stereotypes, but create rounded characters we can engage with as if they were real people. And not just the protagonist either, but the supporting characters and villains as well! And with that, it’s time for the moment you’ve been waiting for. Here are our next Winter 2019 Screenwriting Contest results: the Semi-Finalists! Keep an eye out for more Winter 2019 Screenwriting Contest results from us, as we move on now to judge our Finalists and winners – and decide who takes away the Grand Prize! Winter 2019 Screenwriting Contest Results – Quarter-Finalists! 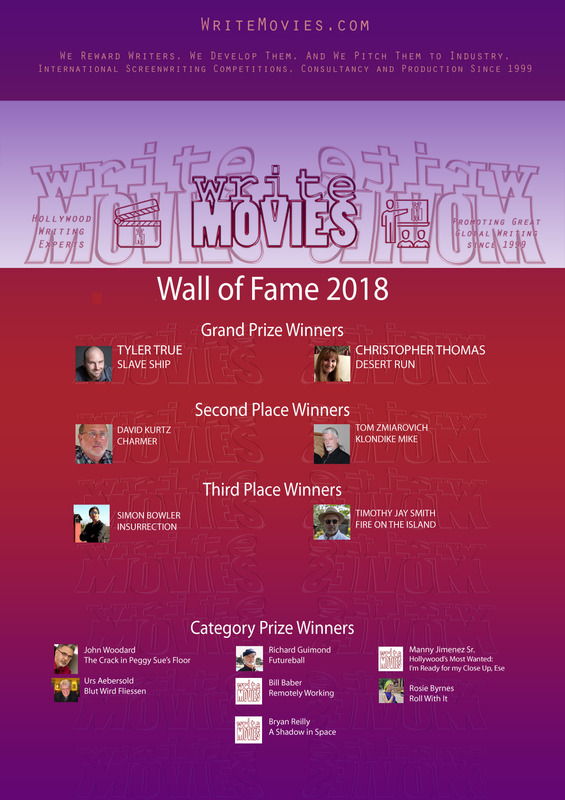 Wall of Fame 2018 – Our Grand Prize Winners! Today we look back at the winners of our Grand Prize from 2018 and reveal our full Wall of Fame 2018! If you’d like to see your name on next year’s Wall of Fame, enter our Winter 2019 Contest for a chance to come out on top – as well as the chance to win our Grand prize of $2500 in cash! Here’s some more info on our Grand Prize winners from 2018. All of our winners received a year of free script development with us and we’re now working hard at polishing them to perfection! Wish you’d been featured on our Wall of Fame 2018? If you think you’ve got a script that will take you to the top, be sure to enter our Winter 2019 Screenwriting Contest! Closing on January 13th 2019, this might be the last time we run a major competition of this kind… And with an increased cash prize of $2500, this is an opportunity not to be missed! Spring 2018 Contest – Our Second Placed writer and script! We’ve got another great script to present to you! Our Spring 2018 contest 2nd place script is KLONDIKE MIKE by Thomas Zmiarovich! In this adventurous family comedy, Sam McCord inherits a gold claim and decides to put his dead-end job with a corporate mega-store chain on hold and move his dysfunctional family to Alaska for the summer in hopes to strike it rich and solve all his problems. Virtually dragging his wife, 16-year-old son and 9-year old genius daughter to the wilds of Alaska, he soon realizes that he knows nothing about working a gold claim. At a local saloon, Sam meets Klondike Mike, a rustic, flamboyant, vagabond lady’s man prospector, who convinces Sam he’d make the perfect straw boss to run the claim. With no other options, Sam hires him, and under Klondike’s direction the claim is soon running like clockwork. So, what could go wrong? For Sam, everything – from pesky Yellow Jacket attacks, feisty raccoon encounters, cell phone-outhouse mishaps, Magic Mushroom trips with a cookie eating Grizzly bear, and the underhanded dealings with the Bible thumping claim jumpers trying to steal Sam’s claim back. Not to mention, Sam’s worries that his children admire Klondike more than him. Born in Seattle, in the shadow of the aerospace giant, Boeing, my love for movies began as far back as I can remember. From the age of 10, much of my paper route money found its way to the cheap, week-day, matinees in summer at the Columbia City theater, a mile walk from my home on Beacon Hill. Sci-fi, comedy, action, you name it, I could have lived there if I could. As an adult, I never lost that love of the big screen. Even as I raised a family and worked as a Tool Design Engineer, for Boeing. I always dreamed that I had something to contribute to the craft I loved so much. Through the years, I wrote my stories and scripts, developing and learning the craft of writing and story-telling from names like Stanley Kramer, Abby Mann, Michael Hauge, Richard Walter, and others. I’ve had scripts finish in the quarter and semi-finals at Nichol, Austin, and others; am a finalist with Script Pipeline and the Washington State Screenplay Competition; and have had numerous Top Ten finishers. My love of story telling will never allow me to stop trying to get those stories to the big screen for all to see. Spring 2018 Screenwriting Contest – Winners Announced! We are delighted to announce the winners of our Spring 2018 Screenwriting Contest! We’ve read many fantastic scripts over the last few months, but at long last, our Spring 2018 Contest comes to a close. In every genre and in every format, there have been many scripts that shone – but we’ve finally managed to decide on our winners! A massive thanks to everyone who entered, and who gave us so much great material to read! If you want to find out why your script placed where it did in our competition, we strongly encourage you to take advantage of our Script Report services – which are currently on special offer until 31st August 2018! Exclusive prizes from InkTip – an InkTip Script Listing and the winning scripts’ loglines will be featured in InkTip’s Magazine, read by thousands of writers and producers. A great win for Christopher, and a thrilling script with strongly voiced characters. Christopher now takes home those wonderful prizes listed above. A round of applause also for our Honorable Mentions: BLUT WIRD FLIEßEN by Urs Aebersold, LOVERS IN PARIS by Andy Conway, THE CRACK IN PEGGY SUE’S FLOOR by John Woodard, THE UNDERTAKER’S CHILDREN by Natasha Le Petit, THE ELECTRIC WAR by Arthur Tiersky, and HOLLYWOOD’S MOST WANTED: I’M READY FOR MY CLOSE-UP, ESE by Manny Jimenez Sr.
A very well done to everyone named here and the many other impressive scripts we read this time around. It’s been a tough field to choose from! See the results in full below. We’ll be telling you all about our winners in the coming weeks, and getting their script development phase underway. Head to our Facebook page and our Twitter feed to congratulate our top three winners and Honorable Mentions yourself! The results are in… Here are the Winter 2016 International Screenwriting Contest Winners, Runners-up and Honorable Mentions! Thanks to all who entered! From Writer's Digest April 2003, recommending WriteMovies.com as one of the top four sites on the net for screenwriters and film makers: "International in scope, the people behind the site have the experience to teach writers how to write for Hollywood. They offer a forum, articles on every aspect of writing, classes and affordable contests. The site is updated daily". Writers need to feel a connection to their characters – it is through these characters you try and tell your story and the theme of your script. If, as the writer, you don’t feel connected to your protagonist, or don’t provide a convincing counter-argument to them through an antagonist, the audience cannot be expected to do so either.